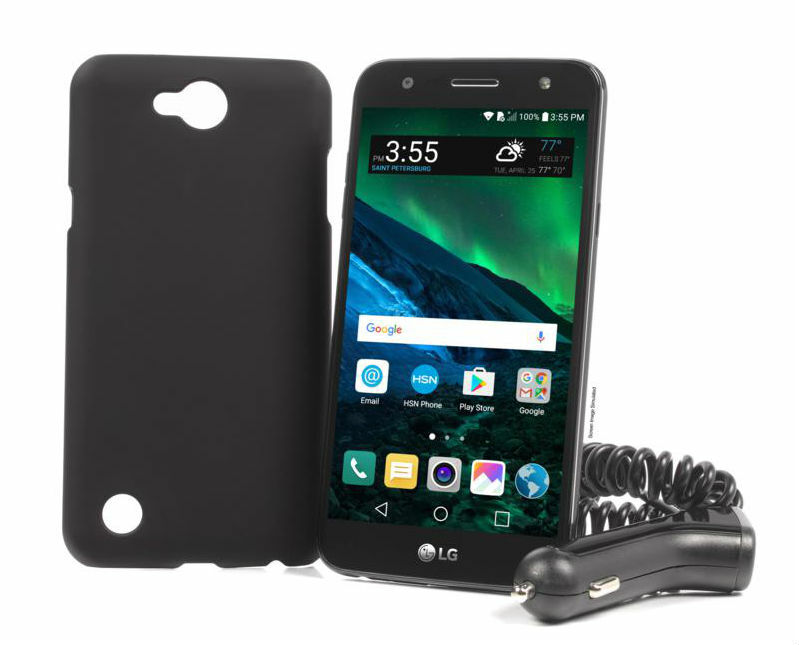 This week's Deal of the Week is the TracFone LG Fiesta 2 16 GB LTE Android phone with 1500 minutes, texts and MBs of data, one year of service, case and car charger for $79.95 at HSN. The Fiesta 2 runs on the Verizon network. It comes with Android 7.0 Nougat and has a Snapdragon 425 SOC, 2 GB of RAM, 16 GB internal memory (9.83 GB usable), a 5.5 inch 720x1280px TFT screen, SD card slot, USB OTG support and a large, non-removable 4,500 mAh battery. Main and front facing cameras are 13MP and 5MP respectively. The Fiesta 2 has been reported to support VoLTE and WiFi calling on TracFone. The phone uses TracFone Smart Phone Only airtime and, like all recent TracFone smartphones, is not a triple minute phone. The Fiesta 2 isells for $99.99 on the TracFone website and the airtime is worth about $100 so this is an great deal if you are a current or potential TracFone customer. Don't buy this phone if you expect to unlock it for sale or use on another carrier. The phone is locked to TracFone. TracFone requires the phone to be used for 12 months before they will unlock it. Third party unlocking services are generally unable to unlock TracFones. In addition, the Fiesta 2 doesn't support GSM, UMTS or non-Verizon LTE bands, so even if unlocked it will only work well on Verizon and Verizon MVNOs. Free Month for New iPhone Customers: buy a new or Certified Pre-Owned iPhone by 6/27 and activate on $50/month Unlimited Gigs plan by 7/13 and receive a $50 account credit within 4 weeks. Free and Discounted phones for port-ins: Moto e5 Cruise free, Samsung Galaxy Amp 2 free, Alcatel Verso Free, ZTE Overture 3 Free, LG Fortune 2 $19.99, Alcatel Idol 3 $9.99, ZTE Blade X $39.99 when you port your number to Cricket. Unlocked GSM iPhone 6 64 GB (seller refurbished) $186.99 Free shipping. Verizon (or Verizon MVNO) Samsung Galaxy Note 4 N910V LTE VoLTE Android phone (new other) $154.99 Free shipping. TracFone Samsung J3 (Verizon) 16 GB LTE Android phone with 1500 minutes, texts and MBs of data, one year of service, case and car charger $99.95 (reg $79.99 w/o airtime) Free shipping. iPhone SE 32 GB (Verizon) with 750 Minutes, 1,000 Texts, 1GB Data/ and 60-Days of Service ($35 value) $214.99. Will the LG G3 EVER make way for newer phones on the top pick deals list? This 2014 phone still has a nice screen and works on most AT&T LTE bands, but the lack of T-mobile Band 12 on the GSM model, and limited LTE compatibility with the Verizon version should surely earn it a graceful departure by now. The eBay seller linked to the deal above claims Band 12 support, but neither LG, Phonescoop or other independent sites show this so I doubt it. Also, you are stuck on Android 6.0.1. Don't complain; it shipped with KitKat 4.4! The G3, along with the Note 4 and Galaxy S5 are among the last flagships with removable batteries. Older flagships are the best budget phones IMO. They cost less and have better cameras and similar performance when compared to current midrangers. The G3 has more RAM than the S5 and is considerably less expensive than the Note 4. The T-Mobile G3 listed here is also rootable and bootloadable unlockable. I don't recommend it for T-Mobile due to lack of band 12 but it has bands 2, 4 and 17 for AT&T. I think it deserves to on the best of the rest list. The Verizon model supports Verizon's main bands and is VoLTE capable. There are already a number of newer unlocked phones on the list; Honor 7x, Moto G5, G5s, G6 and X4. Third part Nougat ROMs are available for the G3 including an official Lineage OS one. Lol while replying with my G3! Thanks as always Dennis. I had G+. Luckily I was able to return it. My E4 is great. "The era of rooting, ROMs, unlocking and removable batteries in decent phones is over." It is not surprising that Apple, the company which gives the least regard to the user experience, has led the way in crippling their devices. Apple spends far more than any other phone/OS company in creating an exquisite, comfortable, accessible user experience. It may be a 'walled garden,' but it is the best walled garden possible, one that pleasantly surprises and delights Apple customers and keeps them coming back for more iOS devices time after time. One droid's "crippling" slur is a million Apple user's 'Thanks' for keeping their old, worn-out (not 'defective') batteries from causing their iPhones from crashing randomly before they can get the batteries replaced (for a $50 discount). "Apple spends far more than any other phone/OS company in creating an exquisite, comfortable, accessible user experience." I don't know why you mention the problem of Apple shipping phones with defective batteries, but it doesn't help your case. A $50 discount for users being forced to pay to repair defective phones that Apple shipped is in itself problematic: users should pay nothing for this, and not be given the wonderful blessing of being discounted on a fee that they should not have to pay in the first place. Only Apple can get away with shipping broken phones and then make their users be happy with paying to repair them! If Apple ships an iPhone with a battery that turns out to have been defective, they will replace it free, even if AppleCare has expired. Sony sold them a batch of iPhone 5S batteries that overheated under certain conditions, and Apple replaced them free. A limited range of iPhone 6S were found to have shipped with defective batteries, and Apple replaced them free. If owners had already paid for a replacement for these batteries, Apple refunded the cost of the repair. No one ever backs up their claims that Apple charges customers to replace defective batteries that shipped in iPhones. Because they can't. ... except for all those instances that are well-documented where Apple demands that people pay $29 to replace the defective batteries in iPhones. They are being sued over this, as many consider charging the customer to repair a defective item to be a scam. "Apple demands that people pay $29 to replace the defective batteries in iPhones. They are being sued over this"
Wrong. Apple is being sued because they did not disclose that they were slowing the processors in iPhones when old, worn-out batteries (usually with a low charge) could not reliably supply enough power for normal performance, resulting in the phone crashing. Crashing on low charge with old, worn, batteries is not unique to Apple. They should have just let the iPhones crash, with hindsight. The only "scam" is the herd of greedy lawyers and customers who want Apple to make them rich. And dishonest Apple-hating bloggers who post false information over and over to get attention. The era of rooting, ROMs, unlocking and removable batteries in decent phones is over. Manufacturers have cracked down on all of those and now the market's matured to the point where innovation is a thing of the past. So nowadays you might as well Go Moto from now on, because spec stagnation has set in abd universal compatibility is one of the few remaining desirable features that Google and phone makers haven't already stomped all over. Sure, you could get still get an old phone with missing bands, limited compatibility, an older unoptimized OS and none of the security features that allow certain apps like Moviepass to run without issue. But if we're being honest, it's really not worth the trouble. I agree. RIP CyanogenMod. Android is hard enough to keep safe without using old versions. And rooting can break security even further, a hacker's delight. Think about it... Is your phone really more secure when draconian policies from manufacturers prevent you from doing what you want with it? It seems to me that their increased presence controlling what you do actually makes it LESS secure. A locked down phone that you can't root or jailbreak is like buying furniture from Ikea, but you can't choose where to put it in your house. An unlocked or jailbroke phone is like a house you can move the furniture everywhere you want, or even turn it at a 20 degree angle. And the version of events preferred by Apple and its most strident Fanboys is one where not only can you not move the furniture in your house, but there is an Apple employee permanently standing in your living room ready to yell at you if you turn your furniture the wrong way or even sit in a chair using the wrong posture. Things are the MOST secure when users can do whatever they want with the property that they have purchased. Because when others/outsiders, control what you do, that's insecure. I agree that Android gives users more freedom and control and I primarily use Android devices. I believe that Android is as generally secure as iOS provided you use a device with the latest monthly security patches, don't install apps from anywhere except the Play Store and aren't a law enforcement target. But, I also believe that Android as a whole is less secure than iOS. The freedom to sideload apps and the lack of security updates for so many devices makes Android devices as a class less secure than iOS ones. FWIW, I've met a few computer security professionals recently and they all seem to use iPhones. "The freedom to sideload apps and the lack of security updates for so many devices makes Android devices as a class less secure than iOS ones." Lack of security updates makes it less secure, but stripping away the ability of the USER to choose to side-load makes it leas secure, to me! I think the phone is more secure when the user has more control over what they choose to do with their OWN device. and less so when you feel the heavy hand of a propeller-beanie guy from far away inside Apple's giant concrete donut, resting on your shoulder, preventing you from doing what you need to do. The link for "Verizon (or Verizon MVNO) LG G3 VS985" is linked to a "LG G3 (LS990)" on Sprint. Kickstart isn'r available any more. Totally off topic, but I almost fell off my coffeeshop stool this morning... looked at my Moto G4 Play and it was offering an update to Android 7.1.1. This would be the phone that I only bought after Motorola said the update was coming out "next month". That would be in May 2017 I think. And after I heard people in S America were getting the update, I trusted them. Oh well, been generally happy with the phone and the Teltik (T-Mobile) $23 plan. ...or you can get the Moto G4 play from the comment above. With Android 7.1.1, you can run this Pizza Hut app on that Moto! And you will still have an operating system it's a lot easier to use than iOS on the iPhone. You're going to have a hard time on the iPhone.. For just one thing that nice consistent back feature on Android is replaced on the iPhone with a back function that is found in every place all over the screen and it's often hidden which makes simply "going back" in an app a puzzle like one of those hidden object games. Nothing consistent. And if you try and just copy songs onto your iPhone, you will find that something that is easy and intuitive on every single version of Android is actually impossible on an iPhone. But in all fairness the camera on the iPhone 6 is a lot better than on your LG or probably any Motorola phone ever made. So if you want a phone that's harder to use but takes better pictures, go with the iPhone. By the way, did it ever occur to you that the fault was with Pizza Hut for making an app that didn't work? Fleeing to iPhone won't protect you from this at all... You'll be out of luck if Pizza Hut did the same sort of silly thing and made an app that only worked on iOS 11 or newer. Which makes no more or no less sense than what Pizza Hut did with the app on your Android 6 phone. iPhones don't "constantly get updated", even though they have a longer and better upgrade situation than most all Android devices. This is mostly a good thing, but it's not always good. There's been a Spate of major problems recently due to Apple forcing buggy un-vetted iOS upgrades on everyone. iPhone 6 is a great choice. Updates every month or so for 3 1/2 years. When this iPhone came out lots of android owners switched cause of the bigger screen. You’ll be amazed how much better this iPhone works compared to Tribute HD (I used to have one of those). Enjoy! I don't know what Pizza Hut app the OP is talking about but according to its Play Store listing, Pizza Hut - Apps on Google Play, the official Pizza Hut app works on Android 4.1 (Jelly Bean) and later. Virtually all popular Android apps work on 4.4 (KitKat) or later. The real problem with Android updates is not the lack of major version updates (Marshmallow to Nougat, for example) but the lack of timely (or any) security updates for most devices. You're right Dennis, thank you for dashing some common sense on this. There's no reason that a simple store app like this would it run on much older versions of Android than 7. I'm sure there's good reasons to abandon Android for iPhone, but this app is not one of them. And no anchovies. IMO, the problem of the lack of timely/any andriod security updates, and major/minor OS version upgrades are BOTH the real problem. If there are no security updates, you need the OS minor or major upgrade for security. And most phones rarely get the latter. So either way, many, many android phones are not secure. Uptake of new OS versions is painfully slow across the board. Hackers know this and the big majority of hackers targeting mobile go where the money is - android. This can't be explained by market share alone. Version updates are primarily feature updates. Occasionally a version update includes a new security related feature like Verify Apps, Android's Anti-Virus which was added in 4.2 Jelly Bean. But patches for newly discovered exploits are in the Security Updates which Google releases to manufacturers monthly. Google issues monthly security updates for the last three major releases, currency Oreo, Nougat and Marshmallow. A Marshmallow phone with the June, 2108 security release should be as secure as an Oreo phone with the same security patch. Yes. However new major releases also introduce new security features not available on older ones. In Android O, you’ll have to grant permission for each and every source, individually, which means that apps cannot install other apps (when users enable the “Unknown Sources” option in Security Settings). Reset protection is another example. There is often some extra security built into the code base in newer versions that might not be replicated in security updates for older major versions. E.G., Lolipop pushed application sandboxing a step further than Kitkat, particularly with respect to inter-app isolation. You break most of that when your root; sandboxing can no longer be reasonably enforced. About 38% of Android phones in use are running versions older than 6, 7 or 8. Many phones running those newer versions aren't getting monthly security updates. Only 7% of iPhones in use are running iOS older than v.10 or 11. This is the fault of Android 4.4 and anybody who is still using it. Unsafe and bugs not fixed. Ting is preselling the Moto G6 Play for 99c off, plus your choice of SIM card. You'll probably pay for shipping, though. Sprint has a killer tablet plan: $25/month for unlimited, including 10GB fast hotspot data. 480 resolutions looks great on my iPad, but you can pay extra for full HD if you want. No need for an unlimited data phone plan. No way I'm going to watch a lot of movies on a 5.5-5.7" screen. And lugging a 6" phone so you can watch movies better is a hassle and looks low-class. Sprint lets you add this unlimited data tablet plan to the Free Unlimited Bring Your Own plan. They give you a $10 discount for a BYOD tablet, so it only costs $15 with autopay. Sprint SIM costs $2.99 if you need one. "And lugging a 6" phone so you can watch movies better is a hassle and looks low-class." There's no way that it looks "low class".. this is pretty much the standard size for state-of-the-art well-designed phones. I think you are in the tiny minority that "too small to use" phones are better. 6" is phablet - neither phone nor tablet. A really awkward compromise. They aren't convenient to do anything really well except make your pocket bulge if thats what you wanted. Phablets are anything over 5.5". And they are inconvenient to carry and use. I agree, and phablets include 5.5" phones too. The 16:9 ones are too wide, look fat. Dockers says they had to widen pockets on jeans so these things would fit. The new 2:1 models are fine for me though. Screen size doesn't tell you much about the overall size of a phone. The 5.8" Galaxy S8 is smaller in every dimension than the 5.2 Moto G5 Plus. 6" in a phone. Just about the perfect size, and the most convenient for most people. The "phablet" idea faded out a few years ago. "Don’t call them phablets, just call them the fastest growing connected device segment"
"DC’s definition for phablets is outdated , just like not so long ago even 5 inch devices were phablets, now you can’t call 5.5 inch a phablet anymore. 5.5 is mainstream. Anything from 4.9 to 5.5 is mainstream., bellow you got smaller phones and above phablets. Even 5.7 might not be a phablet anymore at this point since it’s pretty normal." Since the above comment from 2014 was made. the size of a normal phone has increased a little bit, pushing the "phablet" term into even more irrelevance. As for phones over 5.5" inches, they are far and away the most popular and drive demand, and it is exactly due to their convenience and that they excel as phones and other devices. You seem to be stuck in the era when smart phones were hardly larger than credit cards... a painfully tiny and inconvenient size... and seem to have the purely imaginary idea that the phones were so tiny because it was the best size. As opposed to the reality: back then, unlike now, it was cost prohibitive to make and sell phones the optimal 5.7" plus size. The $150 g6 Play at Best Buy is probably the best deal on a one-year phone.